Northeast Namibia is home to the largest free-ranging black rhino population in the world. These specially desert-adapted animals are spread across more 25000 ha of arid land, most of it unfenced and with no protected area status. Since 1982 Save the Rhino Trust (SRT) has monitored this population, recording important information about the rhinos’ ecology and behavior. For much of this time the population has increased, but in recent years the global surge in rhino poaching has hit this region and these animals have needed more than just monitoring. Since 2014 SRT has worked with the Ministry of Environment and Tourism to provide training, resources and personnel for anti-poaching operations that operate in parallel with traditional patrols. These are conducted on foot, by vehicle, from the air, and on camel and donkey in the most inaccessible locations (which make up 35% of the total area covered). Intelligence is gathered from local informants, and high-tech systems are used to plan patrols. Local communities are engaged and updated through talks and presentations, newsletters, and local media appearances. 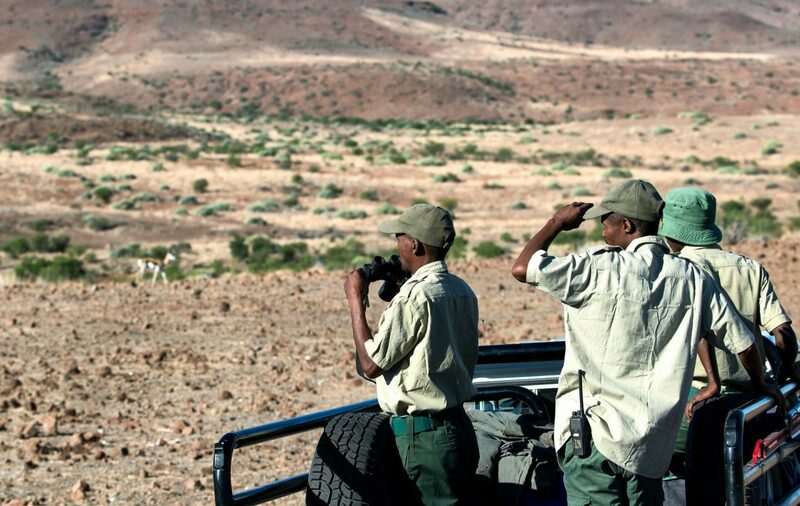 Tusk’s original support was directed to the monitoring teams, in particular the camel unit, helping the game guards to monitor rhino across the vast areas that cannot be reached by vehicle. In recent years Tusk’s focus has moved to the anti-poaching work providing support for the operational costs. This critical black rhino population, which had been steadily recovering since the 1980s, is now facing a renewed threat from poaching. We must continue supporting the vital work of SRT to keep these precious animals safe.